The workforce is getting grayer, and it appears that business practices have yet to catch up to the trend. The U.S. Bureau of Labor Statistics reports that workers 55 years and older are the fastest growing segment of the working population. Pair that with the fact that less than 6% of companies have a specific plan to address the aging workforce, and leaders may be caught flat-footed when working with team members who are in their sixth (or seventh) decade of life. People in their 50s and beyond have a lot to offer their employers. As Chip Conley, author of "Wisdom at Work: The Making of a Modern Elder," observes, “there exists a generation of older workers with invaluable skills—high emotional intelligence, good judgement born out of decades of experience, specialized knowledge, and a vast network of contacts” who can pair with younger colleagues to create enduring business success. Are you making the most of your experienced talent? Here are some ways to ensure that you are doing more than just paving the way to a smooth retirement for your most senior staff members. Are unconscious biases towards the 50+ population seeping into how you assign projects or consider promotions? The stereotype of middle-aged folks being out of touch or change-resistant is firmly entrenched. It is true that younger workers perform better on tasks requiring rapidly changing parameters, but more experienced workers have less variability in performance and are less likely to cause errors than their younger counterparts. The takeaway? All ages contribute positively to the team, but in different ways. So examine your thinking to ensure that you’re not falling prey to inaccurate perceptions. Conley describes the “Experience Dividend” that seasoned workers bring, citing their ability to have a positive effect on those around them. “There’s growing data showing that the presence of older workers increases productivity of younger workers due to the elders’ advice and guidance,” writes Conley. If you’re a younger manager, keep in mind that your veteran employees have been around the block a few times. That shiny new idea you recently pitched that tanked? It’s probably been considered before in various forms. Ask your experienced team members for feedback on why it didn’t work in the past and then work together to craft an improved strategy for this go-round. Companies have had success with reverse mentoring -- pairing experienced and novice colleagues so they may learn from one another. Even if your company doesn’t have a formal program, you can put something in place for your department. Watch for employees of differing ages who have complementary talents and pair them on a project. Tell them why you think they are a good match and what you expect each person to contribute. After you create that list of people, start by inviting them as guest speakers to department meetings. If they’re willing, invite them to mentor key people in your department. And, if your list comes up short, then look outside your organization for positive role models of continuous learners who are vibrant contributors to your industry. 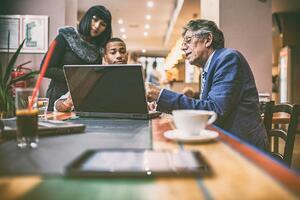 Are you capitalizing on the wisdom from your most experienced employees? Don’t let outdated thinking or stereotypes keep you from making the most of your entire talent pool. Use these four tips to successfully lead the late-career employees on your team. Originally published on September 11, 2018 by SmartBrief. Jennifer V. Miller is a freelance writer and leadership development consultant. She helps business professionals lead themselves and others towards greater career success.